Annette Wehrmann, Ufos, Shedhalle, 1999© VG Bild-Kunst, Bonn / Annette Wehrmann, Courtesy Ort des Gegen e. V.
On June 29, 2018, a space station will land at the Kunsthalle am Hamburger Platz and present UFO Works by Hamburg artist Annette Wehrmann along with works by students from the Heinz-Brandt-Schule (Berlin-Weißensee). In January 2018, students at the Heinz-Brandt-Schule along with Katharina Gerszewski (Ort des Gegen e. V./ Association for the administration of the Annette Wehrmann Estate) embarked on an artistic and creative examination of Annette Wehrmann’s (1961–2010) work. Since April 2018, the students have increasingly engaged with Wehrmann’s UFO Works. Contrary to any initial associations, these UFOs are not extraterrestrial spacecrafts, so much as constructions through which one acquaints oneself with unknown and even utopian world views or develops their own world view and is given space to discuss it. 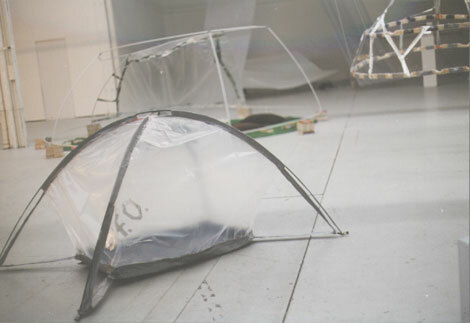 Berlin artist Malte Bartsch joined the group during this phase of production to develop visitor-accessible UFOs with the students that function as spaces of dissent. The sculptures, designs, drawings, and concepts that emerged from this process will be presented alongside Annette Wehrmann’s UFO-readings and UFO-works in an exhibition jointly developed by the students from June 28 to July 5, 2018 at the Kunsthalle am Hamburger Platz, Berlin Weißensee. Gegen (…) bauen! is a project of the cooperating partners KW Institute for Contemporary Art and Heinz-Brandt Schule. It is facilitated by the State Program “Kulturagenten für kreative Schulen Berlin” of the German Children and Youth Foundation (DKJS), and supported by the Senate Department for Culture and Europe. With special thanks to Kunsthalle am Hamburger Platz, BEAMAROUND Projection and Event GmbH and Ort des Gegen e. V. / Estate Annette Wehrmann.